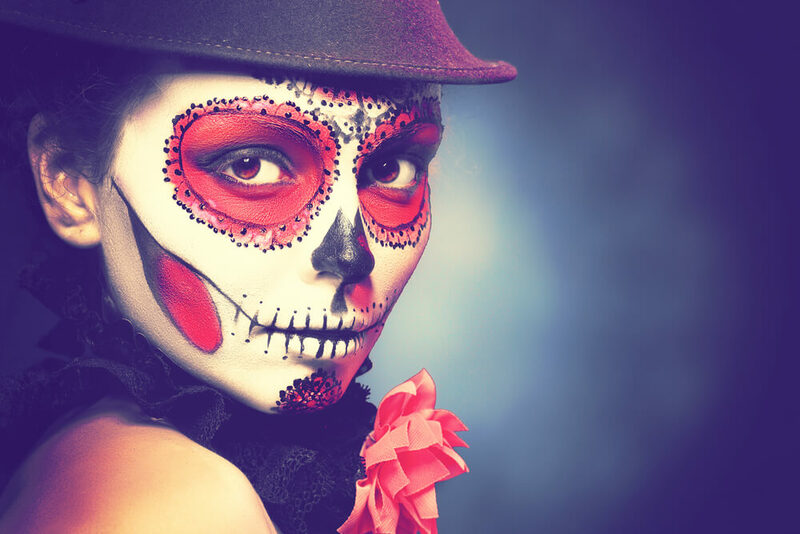 Halloween make-up hacks that let you scare with flair! It’s dead easy (sorry!) to give yourself that unhealthy straight-out-of-the-coffin complexion. All you’ve got to do is use a foundation that has the opposite undertone to your skin or is 3-4 shades lighter than your normal skin colour. For example, if your skin tone tends towards the redder end of the spectrum a yellow-toned foundation or concealer will pale you down. After you’ve applied that base layer, use the back of your hand to mix a small amount of eyeshadow into liquid foundation and then apply with a sponge to your face and neck – that’s the gross ingredient which will really give you a ghoulish “I’ve come to eat your brains” tint. Finally, add either taupe or grey eyeshadow around your cheekbones, jawline and eyes to create a dramatically cadaverous contouring effect. Who needs prosthetics when you’ve got lash glue and toilet tissue? Just clean and dry the area where you want to apply the wound, brush on a very thin layer of lash glue, and then add a layer of torn and crumpled tissue paper. Keep repeating these steps until the wound looks suitably textured and grisly and then use foundation to match it with the rest of your skin tone. Finally, use red liquid lipstick to make the tissue tear look really fresh and nasty or, alternatively, create your own ghastly fake blood by combining a cup of corn syrup and two tablespoons of chocolate syrup with 6-10 drops of red food colouring. Be careful though, if anyone around you is prone to fainting this fake blood is revoltingly realistic! If you think faked wounds sound too simple, cracked skin can really test your imagination and body art skills! After you’ve applied your base foundation, draw the cracks onto your skin using a black kohl eye pencil and then use a gel eyeliner inside the cracks to create thickness and depth. Finally, get as creative as you like by carefully painting in whatever’s been ‘revealed’ beneath the broken skin – it could be anything from bone and tissue to small gears and pistons, or maybe you’ll want to go completely Twilight Zone and pretend there’s a whole universe of stars and planets beneath your skilfully fractured flesh. If you want a Halloween look that really shows off your artistry, cracked skin is an eye-catchingly haunting way to go! If there’s one thing all the best Halloween femme fatales have in common, it’s a hypnotic gaze their victims can never turn away from. All you have to do to achieve the same effect is apply black eyeshadow to the crease of your eyelid and then blend it upwards towards your brow. Do the same to your lower eye but use a different coloured eyeshadow between your lash line and the lower crease and then fill in the waterlines of your eye with a Kohl pencil of the same colour (we suggest white, blue or yellow to really make your eyes pop.) Add the thickest false eyelashes you can find (and maybe some creepy contact lenses) and you’ll be trick or treating with the gaze of a gorgon! And there you have it – four easy make-up hacks to transform you into the bewitchingly beastly belle of the Halloween ball! Who needs to pop on a dodgy Bride of Frankenstein wig on October 31st when, with a little bit of patience and imagination, you could make yourself up to look really Spooktacular? !